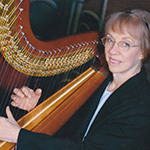 Sylvia Clark has played the harp in orchestra, band, and opera. She has played for weddings and events in the Valley since 1982. Her Bachelor’s degree is in Music History from the University of Illinois. Her Master’s degree is in Music- Thesis from UTPA. She works as a substitute teacher in McAllen and Edinburg. Would you like to learn about the basics of harp playing? What is the structure of the pedal harp? How do you tune it, transport it, play it? What does harp music look like? What are the pedals for? How do you know which strings to play? Come join us to learn more about the pedal harp and try playing it yourself.